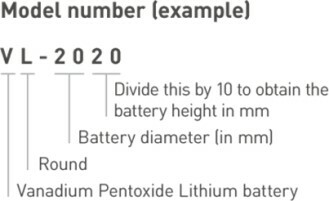 These days Lithium battery technologies are getting more and more important. Due to their high voltage, low self-discharge and proven reliability a broad range of applications can be powered. 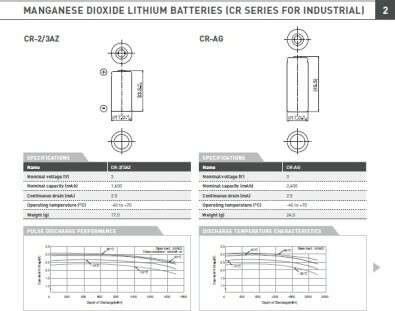 In particular the chemistries BR, CR and ER battery technologies are leading the industries. 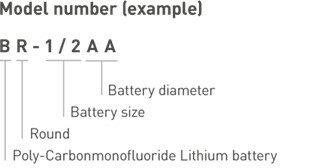 Our Panasonic Poly-Carbonmonofluoride Lithium batteries (BR series) are ideal for applications such as meters or smoke detectors which demand either long-term power supply reliability or need to handle a wide temperature range. Capacity based on standard drain and cut off voltage down to 2.0V or 4.0V at 20°C. Model BR-1/2AA: operating temperature range is from - 40°C ~ + 100°C. 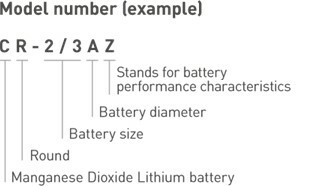 The illustration shows only one example of Lithium battery structure. 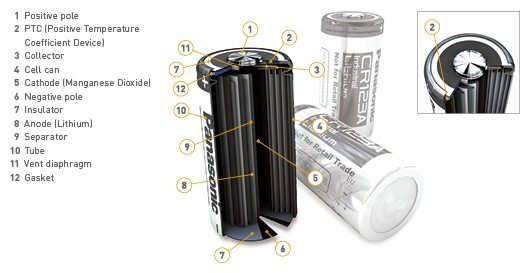 Panasonic Photo-Lithium CR type cylindrical batteries come as either single cells or dual cell packs. 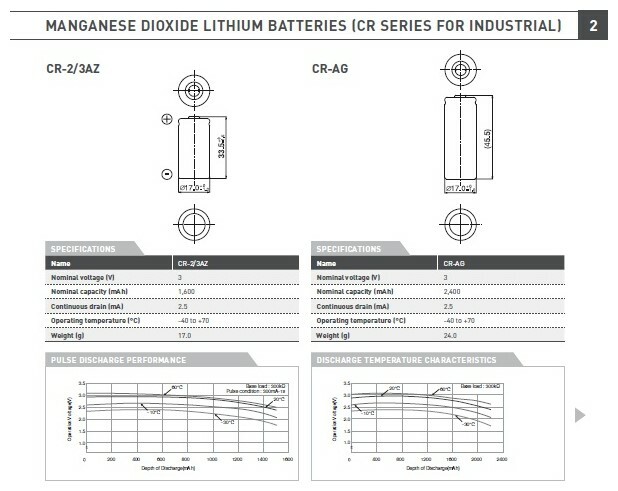 All cylindrical type Manganese Dioxide (CR series) Lithium batteries feature a spiral structure. With the enlarged electrode surface areas, they permit a current as high as several amperes to be drawn. In case of usage below 20mA discharge please consult Panasonic. Ideal for industrial equipment, this series offers both excellent high-rate discharge performance and a long service life of up to ten years. 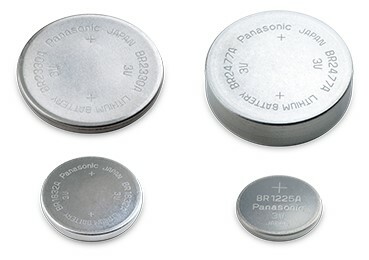 Panasonic Lithium BR coin type batteries feature high energy density, and were developed and commercialized using Panasonic's extensive experience in battery technology. They exhibit stable performance under high ambient temperatures. Capacity based on standard drain and cut off voltage down to 2.0V at 20°C. The high energy density and the special material for gasket and separator make this battery series the ideal power supply in high ambient temperature applications. Only batteries with terminals are available. These batteries have a proven track record of excellence in equipment requiring high currents. 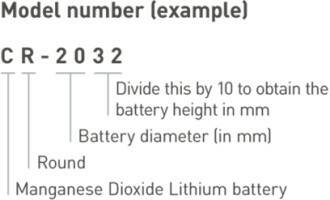 Additionally Panasonic has many years of manufacturing experience with this battery technology. These Panasonic rechargeable Lithium coin batteries are designed chiefly for memory back-up applications. 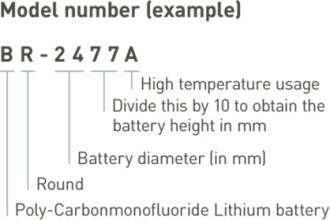 Their voltage ranges from 1.5V to 3V. Capacity based on standard drain and cut off voltage down to 1.0V at 20°C. Capacity based on standard drain and cut off voltage down to 0.5V at 20°C. 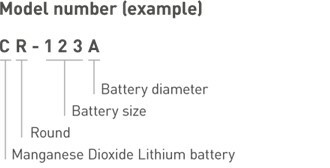 Panasonic offers a broad range of different tabs for our Lithium batteries in order to meet all customer needs. In addition tailormade solutions are possible as well. Italian REA No. : GE-337887 - Italian C.C.I.A.A. of Genoa No. : 01030310997 - Social Capital: 15.000,00 € i.v.